Grain is offloaded from this freight train at the SMS Rail Lines in the Fort Edward Industrial Park. From the large conveyor system, the grain is then loaded in trucks and transported where needed. SMS Rail Lines, a railroad freight company based in Bridgeport, N.J., has a busy hub where it loads and unloads railroad cars for shipping product to markets in the New York-Vermont borderlands. The freight company took over the former G.E. watering site at the Fort Edward Industrial Park in 2017 and converted the site into a grain transfer station for dairy farmers. Since acquiring the Fort Edward Industrial Park site, SMS Rail has steadily built up the transfer station as a nexus for offloading commodities to market. Among the companies that SMS Rail is in discussion with to provide transloading service in Fort Edward are Gavilon and Logistics One. “We are in talks with Gavilon, a broker for canola, to transfer their commodity,” David Marsh, a consultant for SMS Rail, said. “Business is growing and we are looking into expanding our operations to products like corn, like they used to do in Albany. Farmers are here and they need corn,” he said. “We are also receptive to transloading non-grain products like rock salt,” Marsh said. 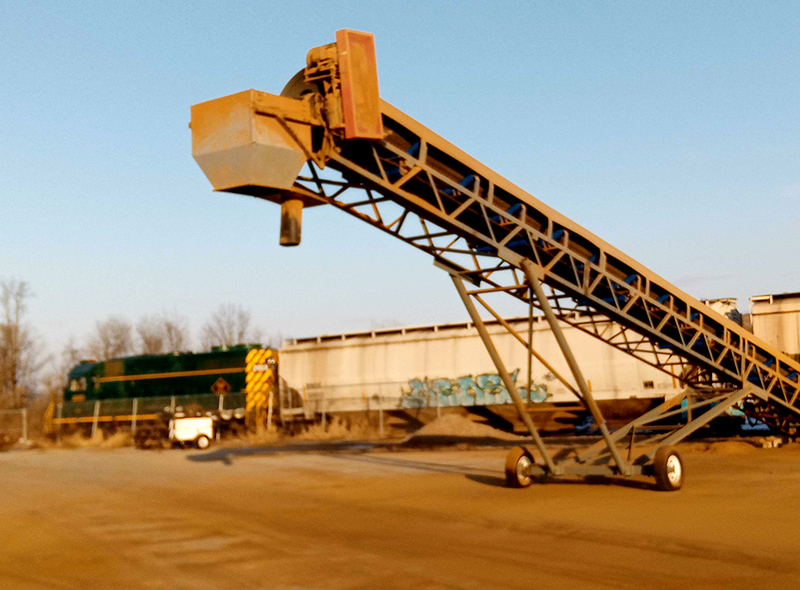 SMS Rail is working with other commodity companies like Logistics One of Saratoga Springs to provide transloading operations from rail to truck. Transloading is the process of transferring a shipment from one mode of transportation to another. It is most commonly employed when one mode cannot be used for the entire trip, for instance when goods must be shipped internationally from one inland point to another. “One hundred tons of product are shipped in a rail car and loaded into trucks for transportation to markets. You transport the commodity by rail for long distances, then transport it to the final destination within 150 miles of Glens Falls to markets by truck,” Marsh explained. The Fort Edward transfer facility comprises approximately 500 acres of flat ground where over 300 miles of railroad tracks converge to transfer 100 tons of products the final leg directly to specific markets. According to Marsh, commodities with that amount of product cannot be delivered unless by rail. “I envision a one-railroad haul from Canadian Pacific Railway to SMS Rail to open it up to lumber distribution,” he said. Another idea that SMS Rail is looking into is using the Fort Edward facility as a storage site for rail cars when the markets go sour, holding them there until the markets readjust.